I thought I would make a brief post to share a new stamp set in the Occasions catalog called Friends and Flowers. When I first saw the set, I wasn't convinced it was one I would want, but then I started to see possibilities. I have seen bunnies and other critters, flowers...all kinds of things created with the different elements. In my January swap, here is the card I created. It resulted in a very flat, although layered card. Kind of pretty I think! 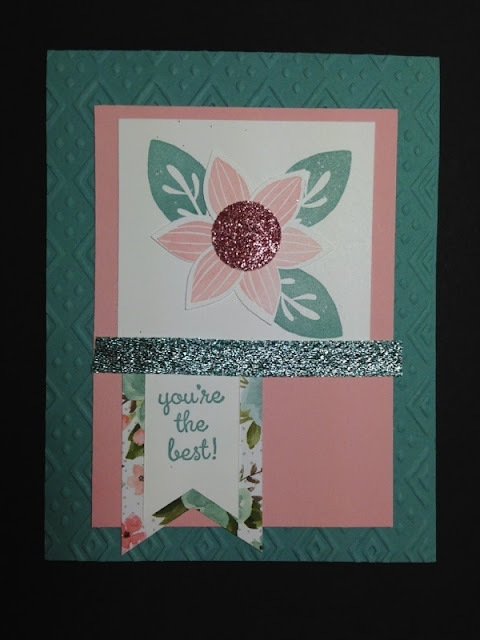 I used the Festive Flower Builder punch to cut out the flower petals.